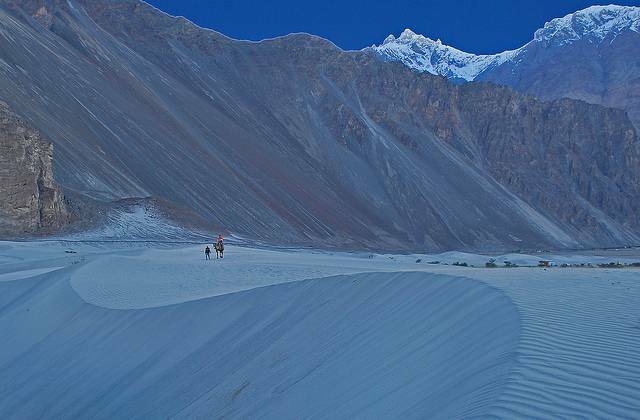 A beautiful but remote village, Hunder is the oasis to the cold desert that Nubra valley is. Though the area surrounding Hunder is arid and desolate, the village, however, is a vast expanse of green and abounds with cultivable land. Forests of sea-buckthorn - popularly known as ‘Leh Berry’, a medicinal plant rich in bio-molecules, vitamins and nutritive properties are found here. Hunder Gompa, the Buddhist monastery of the Hunder village is one of the oldest in the Nubra valley. It has some old frescos and a statue of Buddha. The monastery is also the best place in the village for a view of the dipping sun. One can witness the ancient cultures of the valley during the celebration of the Festival of Hundur, jointly celebrated by monasteries of Diskit and Hunder. Performance of the Cham dance, display of traditional arts and sports is the highlight of the festival. Due to its remoteness and the lack of proper accompanied, Hunder is not very popular with tourists. But campers and trekkers stay in tents or in the homes of the locals, who include food in the nominal rent they charge. Nubra Organic Farm is also a preferred source of food. Guest houses and private hotels with basic facilities are available in Hunder village. Villagers also provide homestay for nominal rent which includes food. Nubra Organic Farm is popular with those planning to go camping.